I recently went to a meet in Montreal and fell in love with a local e30 325i (I believe it was an 325is but not familiar with the model variants). So I've set out to purchase one for myself, on a limited up front budget. Since I've never purchased a car older than 10-15 years, much less a BMW, I was wondering if anyone could give me pointers about what to look for when seeking out a car such as specific questions about various maintenance that should have been done on the car or parts that definitely need to be changed and the likes. I'm used to volkswagens, i.e. timing belts, calipers and f en sensors... and rust, definitely rust. Switching to an older BMW means I just need to know a bit about model specific things. I hope you guys out there know where I'm going with this. I'm hoping I can find a decent one during the course of the summer to have a project to work on next winter. If you are OK with older VW's, you will be fine with an E30, they are just about the same, just one is "high'er end" and more "fun to drive"! 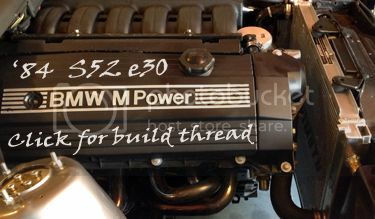 There is only 2 problems with the E30; RUST, and a S#%t load of small issues! They are not complicated, you can do most jobs on them with $100 worth of tools. Most problems have been covered milions of times on the net, and you can find ALL the info you need very quickly. Maintenance: Timing belt. If you don't have a paperwork showing it was done by the dealer, you should do it yourself. These are very easy cars to work on, and very rewarding to own. Rust! Rust! Rust! All that matters is finding the car with the best condition paint and the least amount of rust.... and generally speaking the cars that fall into that category are typically fairly mechanically sound as well. As mentioned before check for rust, also Google for scrap yards in your area...they will come in handy for little stuff. Basically you will need to change every part that contains rubber bushing, seal and a ball joint...this would dramatically increase smile on your face. About 1000.00 worth of oem quality parts from Pelican Parts ...plus your free labour. Remember this word - RUST. Cars without it worth paying premium over rust bucket with new control arms and e36 steering rack. PM sent about a car that looks promising. I was out of town for the week-end and I come back to this. Much better than VWvortex! Thanks for all those that replied, I'm checking 2-3 out at the moment, will post link to ads soon enough! Cheers guys! thanks a bunch! An 84~88 car with the big steel usdm bumpers. 89~92 cars had plastic bumpers. And from my experience, good E30's (as in good deals) are usually sold in a day. Gotta be quick! Read through it, helps a lot.